Population: On 1 January 2019, there were 19,675 inhabitants registered as living in the inner city of Bruges. 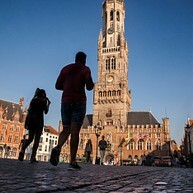 The total population of Greater Bruges on the same date was 118,176. Opening hours: Most shops operate from Monday to Saturday, opening at 10.00 a.m. and closing at either 6.00 or 6.30 p.m. But this does not mean that you need to go home empty-handed if you come to Bruges on a Sunday. Many specialist stores are open on Sunday as well. And on ‘Shopping Sundays’ – the first Sunday of the month, except on public holidays, from 1.00 p.m. to 6.00 p.m. – they are joined by the majority of the other shops. Saint John’s Hospital has an eight hundred-year-old history of caring for pilgrims, travellers, the poor and the sick. 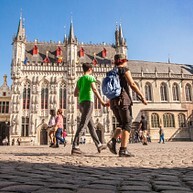 Visit the medieval wards where the nuns and monks performed their work of mercy, as well as the church and the chapel, and marvel at the impressive collection of archives, art works, medical instruments and six paintings by Hans Memling. Also worth a visit: the Diksmuide attic, the old dormitory, the adjoining custodian’s room and the pharmacy. Bruges’ City Hall (1376) is one of the oldest in the Low Countries. It is from here that the city has been governed for more than 600 years. 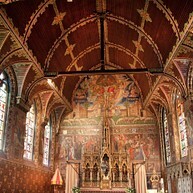 An absolute masterpiece is the Gothic Hall, with its late 19th-century murals and polychrome vault. In the historic chamber next door original documents and artefacts are used to evoke the history of the city’s administration through the centuries. On the ground floor, the structural development of the Burg square and the City Hall is illustrated. 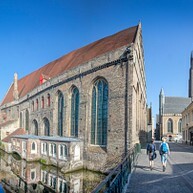 The 115.5 metres high brick tower of the Church of Our Lady is a perfect illustration of the craftsmanship of Bruges’ artisans. 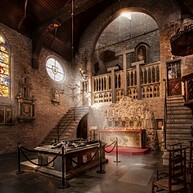 The church displays a valuable art collection: Michelangelo’s world-famous Madonna and Child, countless paintings, 13th-century painted sepulchres and the tombs of Mary of Burgundy and Charles the Bold. Useful to know: at the moment, large-scale renovation works are still being carried out, so the church is only partially accessible and many works of art cannot be viewed. The choir was renovated in 2015 and the remarkable church interior can now once again be admired in all its splendour. In the spring of 2019 (subject to amendment), the Gruuthuse Palace can again be admired in all its glory. 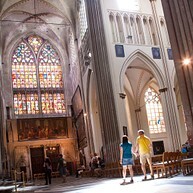 After a thorough restoration and refurbishment, you discover in this museum Bruges and what makes this city so special. The thread of the story is the Burgundian Town Palace itself, that got its current appearance in the 19th century. The rich Gruuthuse Collection with its tapestries, lace, sculpture, furniture and silver, of course, plays the leading role. The ‘Princely Beguinage Ten Wijngaarde’ with its white-coloured house fronts and tranquil convent garden was founded in 1245. This little piece of world heritage was once the home of the beguines, emancipated lay-women who nevertheless led a pious and celibate life. 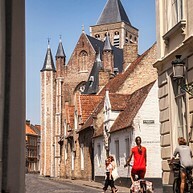 Today the beguinage is inhabited by nuns of the Order of St. Benedict and several Bruges women who have decided to remain unmarried. In the Beguine’s house, you can still get a good idea of what day-to-day life was like in the 17th century. 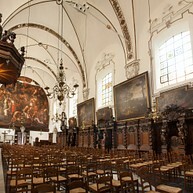 Bruges’ oldest parish church (12th-15th century) has amongst its treasures a rood loft with an organ, medieval tombs, Brussels tapestries and a rich collection of Flemish paintings (14th-18th century). 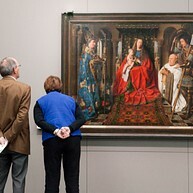 The treasure-chamber displays, amongst others, paintings by Dieric Bouts, Hugo van der Goes and other Flemish primitives. Useful to know: restoration work is currently being carried out in the cathedral. This can influence the opening hours of the treasure-chamber. 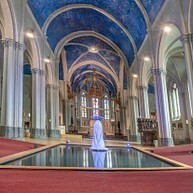 The double church, dedicated to Our Lady and Saint Basil in the 12th century and a basilica since 1923, consists of a lower church that has maintained its Romanesque character and a neo-Gothic upper church, in which the relic of the Holy Blood is preserved. The renovated treasury, with numerous valuable works of art, is also worth a visit. The St. Magdalene’s Church, built in the mid-19th century, was one of the earliest neo-Gothic churches on the European mainland. This style of architecture, first made popular in England, was brought to Bruges by British immigrants. That is how the neo-Gothic appeared in the streets of Bruges quite early. Inside the church you can make your acquaintance with YOT, an organization that explores the meaning of the Christian tradition in modern society. 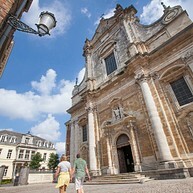 In the middle of the 13th century, the modest St. James’s Chapel was elevated to the status of a parish church. During the 15th century, this simple house of prayer was extended to its current size. The church is now famous for its rich collection of art treasures, donated by wealthy local people living nearby, and for its fine examples of funerary art. The Adornes domain consists of the 15th-century Jerusalem Chapel (a jewel of medieval architecture built by this rich merchant family), the Adornes mansion and a series of adjacent almshouses. In the multimedia museum, you step back in time to explore the life of Anselm Adornes and the Burgundian world in which he lived.